Much of my focus the past five days has been on politics in general and the current administration specifically, but I have also focused on our society. While politics is not the totality of a society, it nonetheless does have a major impact on it. In terms of politics, and what I mentioned yesterday about the need for us to stop casting votes out of fear, we need to be smarter and more active. A number of other steps that may be taken to address this: Perhaps a "None of the Above" option on all ballots or writing in "No Confidence" (as I did for President in 2016). Certainly, the ending of gerrymandering is necessary and abolishing the Electoral College would be a very good thing as well. One final note here of a political nature: We need a president who does not find inspiration from, and does not want to emulate, despots. In 1948, three years after the end of World War II, the United Nations, during what it called the Convention on the Prevention and Punishment of the Crime of Genocide, defined what constitutes genocide. In Article II of the declaration, there are five definitions of genocide listed. One of the definitions is: "forcibly transferring children of the group to another group". Granted, none of the citizenry put this policy into place, but this is a stain on our collective soul. What have we become and what are we becoming? We are both supporting and protesting this activity and we are arguing among ourselves more and more. Agreeing to disagree is being replaced with fighting because we disagree. If you search for "country [loses/lost/losing] its soul" on Google, you will find links to articles arguing that we have, indeed, lost our soul or are in the process. Some of them were even posted after the one-year mark for President Trump, and not just in response to the current manufactured crisis. When compromise is anathema, when differing views are equated with hatred toward one's country and fellow human beings, when being different is condemnable, and when hate itself is emboldened, how can a nation's soul be intact? How can it be pure? The sad truth is it can't be either intact or pure. Right about this point in this posting would be the time to project a positive message about the future. I am not projecting a positive message, at least not fully, and I am not pushing an utter doom-and-gloom scenario, either. Looking at the title of this six-part series, I do believe America is dead. Oh, it's still called the United States of America ... its total land mass is the same ... the number of states is the same ... and our forty-eight contiguous states are still in between the countries of Canada and Mexico ... but America is dead. Now, can it be revived? Yes, but it would take a massive effort from all of us -- and I do mean each and every one of us -- to bring that about. The question is can we all do that? Well, can we? I've thought long and hard on this, and just it seems to me, sad to say, that the idea of a country working together -- not just pockets of that country, but the entire country -- is no longer feasible. ... but how bad do we want it? We have plenty of energy to complain about things in this country -- I've found myself doing that, too, now and then -- but we don't have the stomach for doing the hard work. Part of that, I think, is that things are so rough for people, in terms of the economy, that they have to focus on taking care of themselves. Making ends meet is always a priority and a tough thing to do. I get that ... I really do. The problem is, if that trend continues, might a sense of hopelessness become second nature, like breathing? Have we arrived at the point where we know we are being ignored and all hell has to break loose in order to affect any kind of change? (And all hell breaking loose about every single issue?) Not yet, but we are teetering on that precipice far too often. There were a lot of memes of a gravestone with the inscription of "R.I.P. America 1776-2016", following the election of Donald Trump. I had a sliver of hope, ever so thin that it was, that there would be enough people watching and involved to stem a tide of destruction. In just a year-and-a-half, that sliver of hope is gone. There is a way back, as covered with brush and darkness that it may be right now, and maybe we will find it. 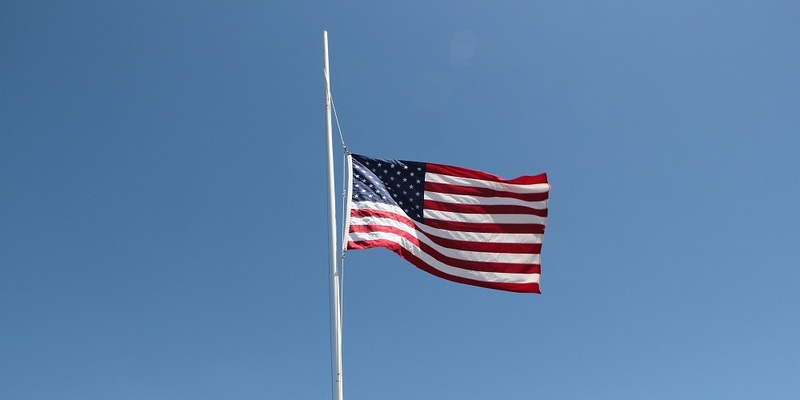 In the meantime, at least for now (and for however long), Rest In Peace, America.